Gaon in Pumbedita and a son of Joseph ha-Kohen. According to the chronicle of Sherira, Sargado officiated from 943 to 960; others declare he died in 942. He was successor to the gaon Hananiah, the father of Sherira. Not of a family of scholars, but an extremely wealthy merchant, he was elevated to the gaonate (presidency of a rabbinical academy) through the influence of his family. Caleb ibn Sargado, the determined opponent of Saadia, who spent 60,000 zuzim ($9,000) in order to bring about the deposition of the gaon of Sura, was probably identical with Aaron, as Harkavy has shown (see "Seder 'Olam Zuṭṭa" in "Anecdota Oxoniensia," ii. 83). Four of Sargado's legal decisions on religious problems are preserved, and are printed in the collection, "Ḥemdah Genuza," Nos. 37-40. One of these, it appears, was the answer to an inquiry from Kairwan. 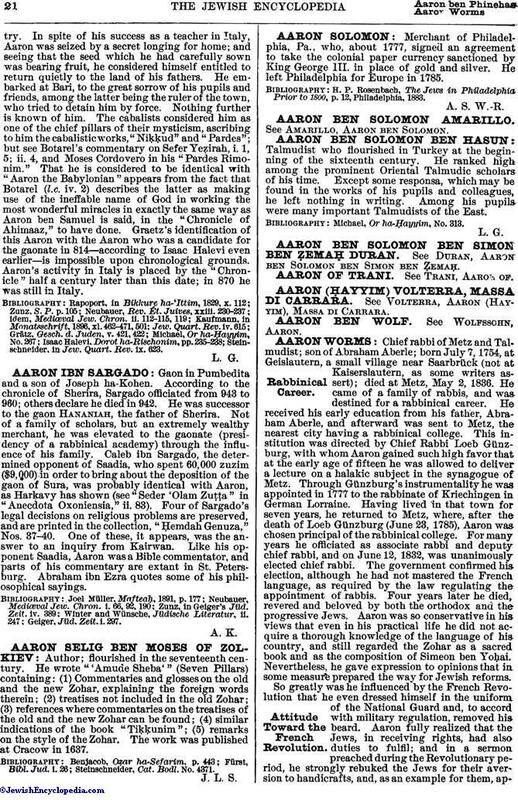 Like his opponent Saadia, Aaron was a Bible commentator, and parts of his commentary are extant in St. Petersburg. Abraham ibn Ezra quotes some of his philosophical sayings. Geiger, Jüd. Zeit. i. 297.